Huawei is known for making smartphones. And some of them are actually pretty good. Now, the company is making convertible tablets too... with keyboards... and Windows 10. The result is the new Huawei Matebook, a device with a striking similarity to the Microsoft Surface but packed with a couple of quirks that make it unique. Like the Surface, the Matebook is a 12-inch, 2560 x 1400 resolution tablet with a detachable keyboard. It doesn’t ship with a dual-boot option (so you can’t load Android onto the system) though Huawei acknowledged it might be possible if your tried yourself. 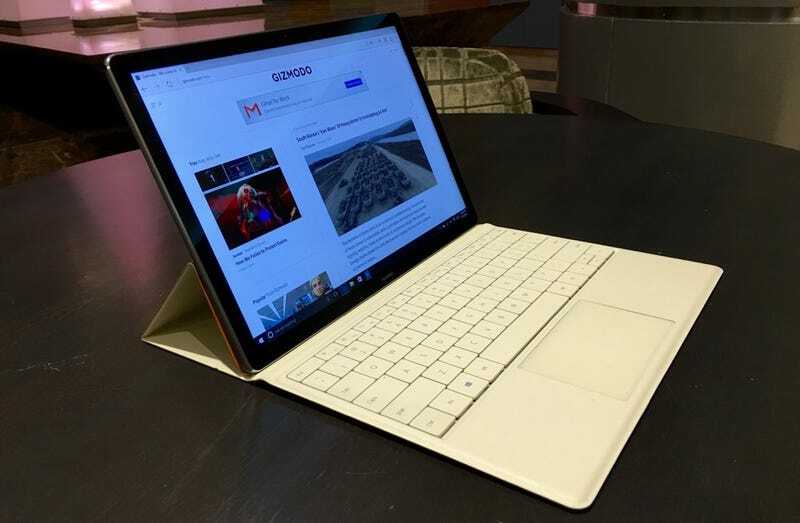 The screen-to-body ratio is 84 percent, which means the device is thinner than the regular convertible laptop, but has the same big display size. Nice. You can rest the case at two fixed positions. It also packs two Dolby stereo speakers which were demoed playing a trailer of Transformers. The trailer was awful, but the speakers were incredible. After a short time with the Matebook, I couldn’t tell if they were as good as the ones on the iPad Pro, but they sounded damn good. On the right side you can find the volume buttons. See that gap between them? That’s the fingerprint sensor (clever!). It’s the same one you can find in the Huawei Mate 8, and during my tests it worked pretty fast. Battery duration is at 10 hours with regular use, 9 if you play HD Video, according to Huawei, and the Matebook is able to keep that thin profile with a fanless design, thanks in part to an Intel Core M processor packed inside. The keyboard is backlit and has 1.5 mm of key travel (similar to the MacBook Pro). It’s not the best mobile keyboard I’ve tried, but definitely better than the average. Like the iPad Pro, there’s no Bluetooth involved with connecting and instead uses a proprietary port on the side of the device. The case acts as both protection and a stand with two different fixed positions. There’ll be four different colors for the case, and two for the Matebook: Space Silver (yeah, like Apple’s Space Grey) and Champagne Gold (well, gold). Huawei wants to “bring the mobile perspective to the PC,” but it’s too early to they have a real winner here. But in order to achieve it, they are merging together to gadgets—the Surface Pro and iPad Pro—that already do it so well. The Matebook uses the new USB-C port so there’s also an accessory that brings you additional ports in order to connect the device to VGA, HDMI, USB 3.0 and Ethernet. And, of course, there’s a stylus, and Huawei claims it has 2,048 points of pressure. 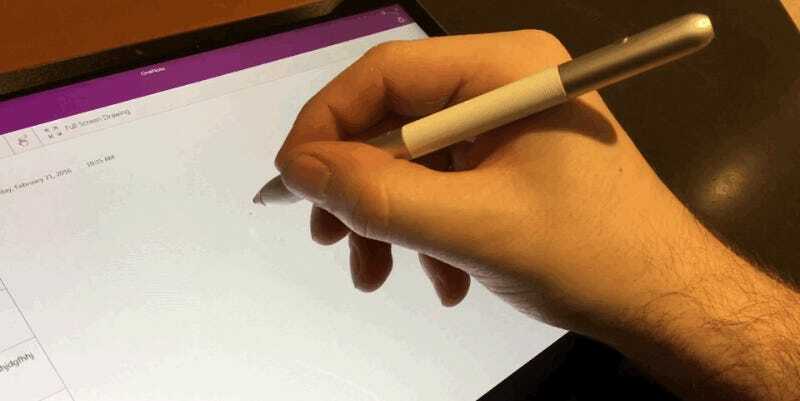 It’s a little bulkier and heavier than the Apple Pen or the Surface Stylus, but the functionality is very similar. You also have laser on one tip, too, so your cat will be delighted/terrified. But we’re missing one key piece of information: the price. Surfaces and iPad Pros are great devices, but also expensive. If Huawei manages to come with a price that’s closer to a tablet than a laptop, we might have a winner. If not, the Matebook will be just another convertible. Interesting, but nothing new. Update: Huawei just announced pricing during its Mobile World Congress press conference. Looks like the Matebook is going to start around $700 for 4GB of RAM and 128GB of storage and go all the way up to $1600 for 8GB of RAM and 512GB of storage. Here’s how the pricing breaks down.